Do you want to learn incredible Rubik’s Cube wizardry? Do you want to take an mixed cube and solve it instantly? If you answered yes, Cube 3 by Steven Brundage might be for you! 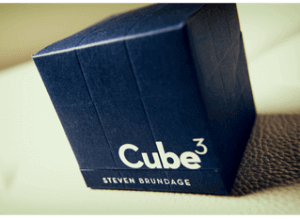 Have a read of my Steven Brundage Cube 3 Magic Trick Review to find out. Where to buy: Amazon, Penguin Magic, most magic suppliers. Cube 3 by Steven Brundage is an amazing trick. I considered finishing this review right there, because there honestly isn’t much more to it than that, but I feel I owe it to Steven to explain why this trick is so amazing. For me, what makes Cube 3 the best Rubik’s Cube magic trick is the fact that it does not require any ‘fake’ or gimmicked cube; this trick can be done with most good Rubik’s Cube’s, and can also be handed out for inspection afterward! In this Cube 3 review I’ll be talking about what this trick is, how difficult it is, and the absolutely CRAZY reactions you can get from it! 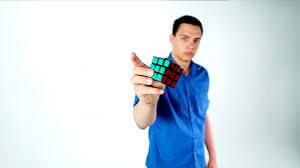 Cube 3 by Steven Brundage is a collection of magic tricks you can perform using only a Rubik’s Cube. Within these effects you can learn things like having a mixed up cube solve itself magically as you throw it in the air, using pure sleight of hand. The good news is that although there is a lot to learn, once you’ve learnt all the moves, it is a fairly simple process to master them until you can perform (literally) blindfolded. Also included within this product is a highly in depth tutorial of how to solve a Rubik’s Cube. The product is split into two instructional DVDs, one that teaches you how to solve a cube, and the other that teaches you how to perform all the effects. It also comes with a very high quality Rubik’s Cube. Realistically, how long is it going to take me to learn these tricks? If I’m completely honest with you, I still don’t fully know how to do all the tricks covered in Cube 3 by Steven Brundage. The biggest reason for this is because I found the tricks that fit my style the best, and learnt those ones to a high level. Don’t be afraid to do the same thing! 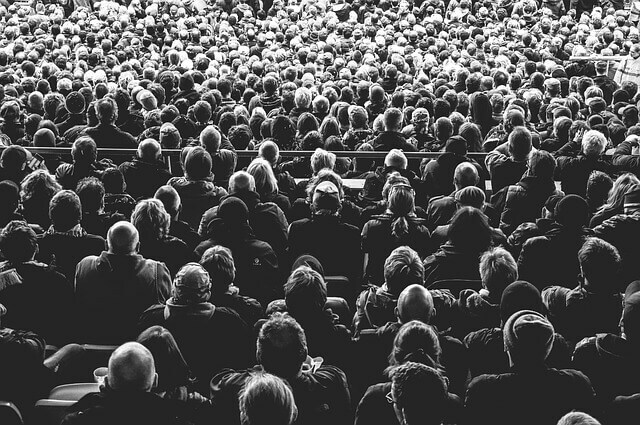 If there are three tricks that you really like the look of, but two that you aren’t so keen on learning, don’t feel obliged to learn them all just because they are there! It would be much better to learn less, but to a higher level. That being said, even if you choose to just focus on a couple of tricks first, it will still take a couple of weeks of practice, once you have the initial method down, in order to be good enough to show them off to other people. It took me a couple of weeks to get confident enough to show my family, a month or so to try it out on my friends, and around a year before I took it to the stage and performed it in front of 800 people. But boy did it get a great reaction! I’ll never forget that show; my first time performing for such a large audience. It was just me and my cousin at a talent show. He was doing ‘lie detector’, and I was doing Cube 3. The audience loved ‘lie detector’ and naturally that made me even more nervous to follow him up. I had the presenter of the show come up on stage, and asked if I could use their bag. After they had given me their bag, I showed the audience a mixed up Rubik’s Cube, and demonstrated that not only was the bag completely empty, but that the cube was also completely normal. I then dropped the cube into the bag, and closed the bag tight, handing it back to the presenter. I asked him to shake it up a bit, and imagine that he was solving the cube in his mind. Once he was finished ‘solving’ the cube, I told him to open up the bag. This was the most nerve-racking experience of my life; had I done it right? What would happen if the cube came out still mixed up? How would I react? 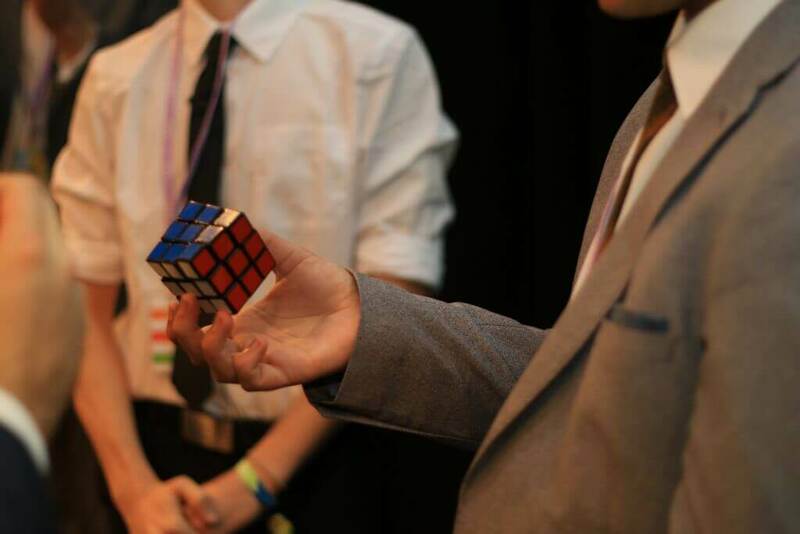 Then he pulled out a fully solved Rubik’s Cube from the bag, and the audience erupted. This picture was taken as it came out (white shirt is me). That night was one of the greatest of my life, and it all came down to Cube 3. So would I recommend this product? Absolutely! Would I recommend you spend a lot of time practicing before you use it? Even more absolutely! This example also shows how great this trick is for stage magic illusions due to the visual nature of the magic. Luckily for you, this trick is available on Amazon, but it can also be found on Penguin Magic (although overseas shipping costs can be fairly high), and a lot of other magic merchants. It prices at around £30 on average, which I think is more than fair for the quality you are receiving! Are there any drawbacks to this product? 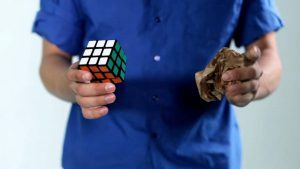 The main drawback to this product is that you’re going to have to learn how to solve a Rubik’s Cube before you can do the effects with confidence (you can theoretically do them without knowing how to solve a cube, but it will be extremely helpful to know), but Steven really goes into detail and breaks the process down to very manageable and simple steps. If you invest time into this trick, you’re going to see results. If you don’t see yourself being able to put a few hours in to learning it, I wouldn’t bother buying it. If you want something that you can amaze people with straightaway, I recommend you check out my Invisible Deck review. If you have the money and the time to invest into Cube 3, than this is going to be one of the most worthwhile purchases you make. Rubik’s Cubes are so recognizable and popular than it can be a great way to introduce your magic to people; chances are that you’ll come across a few lying around at people’s houses. If you feel uncomfortable busting out a pack of cards on someone right now, it can be useful to have magic that you can do with common objects, and then progress to cards or whatever else you might use. What do you think of Cube 3 by Steven Brundage? Do you have any questions which I haven’t addressed? Feel free to post your opinion in the comments and I will be sure to get back to you! This is a pretty sweet site you chose to do! I’ve always been fascinated with magic. After watching the “The Prestige”, I was blown away at how technologically innovative magicians are. It takes so much innovation to make a pull off a simple illusion. Definitely interesting stuff. I love reading magic breakdowns too. 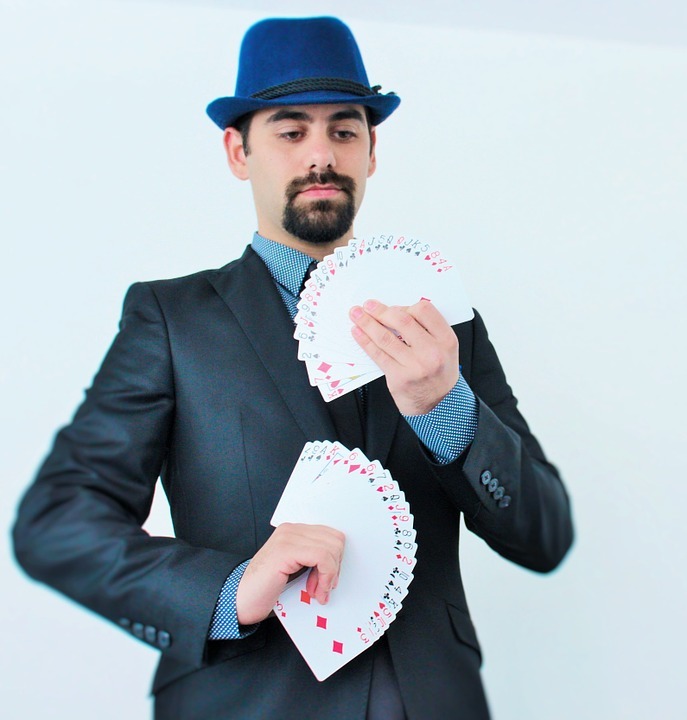 Muscle memory plus sleight of hand can make anyone look like a wizard! Anyway, great stuff, man. Hopefully, I’ll see more of your stuff around! Thanks Wilson! The Prestige is one of my all time favorite films, an absolute masterpiece! Yes that really is all there is to it; muscle memory of the sleights. I love that description. The rubiks cube has always been fun and challenging to try to solve it. I remember when I first found out there is an algorithm for solving it and then it became a learning tool. The Cube 3 has definitely peaked my interests and I am interested to see what rubiks trick are out there. My only question would be are the tricks showcased in Cube 3 exclusive or can you find similar tricks somewhere else on the internet? From my experience, the only other Rubik’s cube magic on the market usually relies on gimmicked or false cubes (Cube 3 doesn’t). 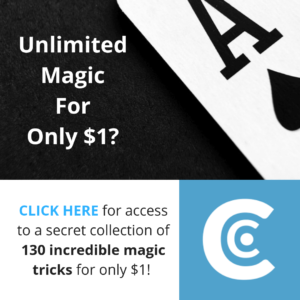 Maybe you will find one or two similar tricks to ones in Cube 3 on the internet, but I don’t believe you will find them all in one place like you can with Cube 3! Many of the tricks included in Cube 3 were created just for Cube 3, so it is very unlikely you will find them anywhere else! Hope that is helpful. God I love this trick. This is the viral video that caused the trick to explode on the scene. Steven was on the way home from a gig and got pulled for speeding, showed the cops this trick and boom, he’s famous! This is just a great effect at gigs, and when I first started performing, I wasn’t sure how it would go. The great thing is that you will actually learn how to solve a rubix cube within a day, two at the most. Cube that comes with it is quality, and you can buy replacements for around £10 ($15). One of the best tricks in my case. Tip: Pretend to be a little protective of the cube, as though you don’t want someone to mix it up… then when you reluctantly let them, they think they’ve “busted” you. Then when you solve it, there mind is blown! Thanks for your great insights Mark! This is also one of my favorite pieces to use when performing magic; it’s a really strong opener becuase it makes them think ‘wow, this guy knows what he’s doing’ and they pay even MORE attention to your next trick. The value is in the teaching material; Steven covers so much detail in the tutorial that I think it’s a steal for the price- and like you say, the Cube is fairly easy to replace. Thanks for the comment! I bought the trick and I love it. However, my Rubik’s cube broke after being handled without care by a child. What kind of cube could I purchase that would equal the one that Cube3 provides? Great question. Luckily, the main selling point and reason Cube 3 is expensive is the instructions themselves; the Cube can be replaced pretty easily. I believe the actual cube itself is a ShengShou Aurora cube; you can pick one up for under £10 or so.